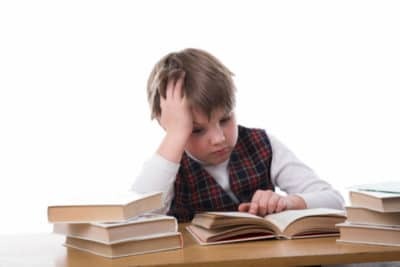 Putting aside, for the moment, the questions of whether or not homework is beneficial and why so many boys hate homework (spoiler alert: It has to do with the fact that a lot of homework is, indeed, a waste of time), how do you get your boys to do their homework? As I was growing up, I spent a lot of time miserable in my room. Not because I had a miserable childhood or anything (well, not entirely) but because the desk in the corner of my room was where I was required to do my homework. Not on my bed, not curled up in a ball on the floor, but at my desk, sitting in a horrible little chair, with my pencils and pens laid out in front of me. I HATED that desk. And the worst part was? I was never productive when I was at it! For some reason, my best work was done on the roof of the garage, or on the Staten Island Ferry as I was coming from home high school. I could write five thousand words in a half hour on those ferry rides. But my desk? Forget it, I wanted to jump out of my bedroom window. See, what we didn’t know back then is that everyone has a happy place, and more often than not, it’s not the happy place that society dictates it to be. For instance, I’m writing you this email right now on a plane headed back from Hong Kong, because that’s where I get my best work done. In fact, of the last five books I’ve written, (including my latest, called Faster Than Normal, that comes out in October,) four of them have been written on planes. And you know what? Three of them are best-sellers. I do my best work (and get into my Zone of Focus) when I’m on an airplane, so I make sure to save as much work as I can for when I’m in flight. I promise you, if you work together with your child to figure out where their happy place is, and allow them to achieve their Zone of Focus the way that best suits them, not society, their productivity will skyrocket. Trust me. If you’re a parent of a child who struggles in school or hates homework, odds are good that you’ve already heard all of the standard homework tips: Make sure your child has a quiet, well-lit place to study. Establish a routine. Minimize distractions. In fact, if you Google “homework tips” right now, that’s the stuff that comes up. The problem with these tips is that a) they don’t work for every child and b) they most definitely do not work for most active boys. The even bigger problem with these tips is that they put the onus on you, the parent, to solve the homework problem. And sure: you can establish a homework routine for your son — but wouldn’t it be much more beneficial to him, long-term, if he figures out how he learns and works best? But given the fact that so many boys struggle with sitting still in school, do you really think that a desk is the best place for a boy to do homework? Instead, why not let your son figure out where and how he likes to work? I know it goes against almost all traditional homework advice, but my 14 year old does best when he can listen to music. My 11 year old even does some of his homework in front of the TV. (Spelling words, people. Copying spelling words, over and over and over. It’s not exactly the kind of activity that requires full-brain focus — and exactly the kind of activity that’s more tolerable with a pleasant distraction.) My 16 year old, on the other hand, does most of his work at school or alone in his room. They’ve each figured out what works best for them, via trial and error, over the years. What they’re doing seems to be working, so I let them go. But what do you do with a boy who resists homework? Involve him. Talk to him, and try to figure out why he’s resisting homework; his answers will affect your response. Second, ask him how he works best. He might not know the answer to this question. Kids who are constantly told what to do — Sit here. Be quiet. Do this. — lose touch with their own internal compass simply because they’ve never had the opportunity to heed it. If your son doesn’t know, encourage some experimentation. Let him do his homework outside. Read while hanging off the couch. At the coffee shop with friends. Whatever other crazy thing seems to make sense to him. In time, he (and you) will likely develop a better sense of his happy places, and what helps him get into his Zone of Focus. That information will help him get through his homework — and set him up for success later in life. Tell me: Where does your son do his homework? Does he have any homework habits that seem crazy to you, but seem to work for him? Resource alert! While researching this post, I learned that Peter Shankman has an ADHD podcast, Faster Than Normal. I haven’t listened to the podcast yet, but I’ve heard him speak in the past, so I’m sure it’s amazing. The title of his most recent episode, More Play=Smarter Kids, definitely caught my attention! Check it out.